Hey everyone! The title is pretty straight-forward, so there isn’t much to go over as far as explaining what this brand of article is all about, so I’ll keep the preamble brief. 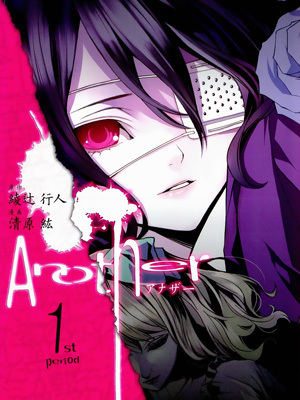 And I figured as Another was the first tv anime I ever wrote a mini review about, what could possibly be more fitting as my first manga review than for the manga adaptation of Ayatsuji Yukito’s Another? the curse of class 3-3? Sakakibara Koichi has transferred into Yomiyama North from his home in Tokyo while his Father is overseas, and left in the care of his Aunt and Grandparents; and he has been placed in this cursed classroom. Upon arrival, he realizes that there is an uneasy air about the way his fellow classmates are behaving, with the oddly distant Misaki Mei being one of the most curious. Then tragedy strikes, and death claims one of his classmates. Was it truly an unfortunate accident, or is this a portend for things to come? While it wasn’t one of the best tv anime series I’ve seen by terms of story (though its problems are mostly limited to subsequent viewings), there’s just something about Another that I love. It’s the right melding of horror and mystery, and it being focused on a specific classroom in a middle school makes it relatable. I’m aware that changes were made from the novel (a big one being the Akazawa Izumi character, who plays a much smaller role in the original story), but the main premise for the story is one that made for a great tv anime series, and I was curious to see what the manga version was like. Turns out, yeah, it’s pretty good as a manga as well. This is like a middle-ground between the novel and the tv anime, where some of the anime-derived tropes are eluded, but others, such as the alterations to the Akazawa character are still present. It’s difficult to be creeped out by a manga without some sort of tasteless gore or otherwise disturbing imagery, and while I’m happy to say the deaths (it’s no spoiler that people die, trust me) aren’t grotesque, the overall tone of the manga didn’t really strike me as horror-esque. The artwork is great though, with more realistic character designs than seen in the tv anime (though Misaki Mei is thankfully pretty much identical), and brief full-color sections at the start of each volume that look just plain terrific. There were points about mid-way through where it seemed as though nothing much was happening, and there were several instances of abrupt scene or topic changes that made me think I must have accidentally skipped a page, but overall I feel like a good job was done with the story, and just like with the other versions, once you hit the finale, it’s impossible to put it down. It’s not an especially frightening or spine-tingling horror story in this form, but I’d say if you’re like me and enjoyed the anime version, there are a few differences in this version of the story that make it worth checking out, with a couple additional scenes that didn’t make that version, as well as some pretty big changes to other parts of the story. If you’re looking for a horror story that’ll keep you up at night, Another isn’t quite that; but if you enjoyed the tv anime or the original novel and want to see yet another great version of the story, I recommend it.